Botanical Name: Stellaria media L.
Common chickweed is widely distributed throughout the world and is common in all regions of the United States. Common chickweed is a broadleaf winter annual. It spreads by seeds which can germinate in the early spring, but most germination occurs in late summer/early fall. Flowering usually occurs in early spring or late autumn. A common weed, it tolerates close mowing and thrives on moist shady sites with nutrient rich soils. Common chickweed forms dense prostrate patches in turfgrass, but may form more upright growth if un-mowed. The stems are branching and smooth except for 1 or 2 rows of hairs. This light green plant has broadly egg-shaped leaves which are pointed at the tip and occur oppositely on the stem. The roots are fibrous and shallow and the plant detaches easily when pulled. The flowers are small, white and deeply lobed. 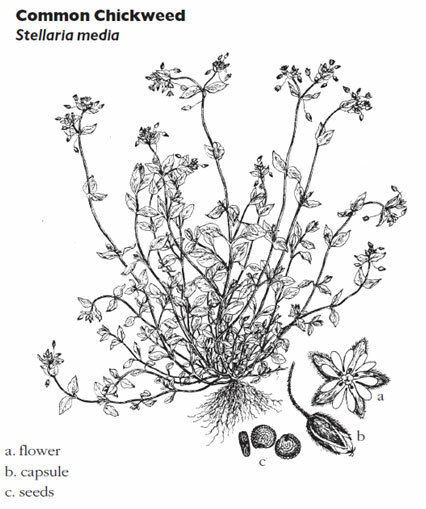 The minute seeds of common chickweed are light brown, to reddish brown with bumps on the surface. Common chickweed is a winter annual that thrives in moist shady areas, although it may occur in other conditions as well. The roots are thin, fibrous and weak. This makes hand pulling easy where small patches occur. Common chickweed cannot tolerate hot dry conditions and usually dies out by midsummer, so control may not be required. Dead plants of common chickweed rapidly break down. Maintaining a dense, vigorous, and tall (3-3.5 inches) lawn will help reduce its spread, and conceal its spring growth until it dies back in the summer. Common chickweed can be chemically controlled with several preemergence broadleaf herbicides. Consult the herbicide label for specific application instructions. Preemergence products must be applied before chickweed germination. Postemergence herbicides which are effective include two- and three-way combination herbicides. The turfgrass area should not be mowed for two to three days before and after herbicide application. The treatment application should be done at a time when there is no rainfall expected for at least 12 hours.